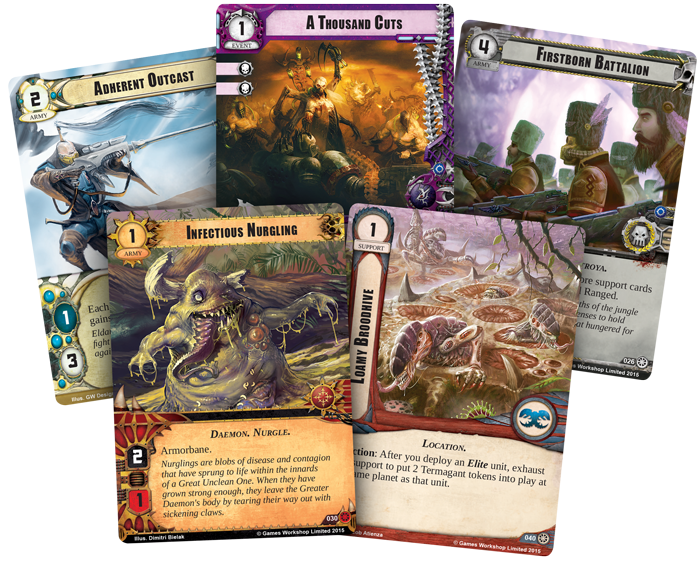 Fantasy Flight Games is proud to announce Unforgiven, the second War Pack in the Death World cycle for Warhammer 40,000: Conquest! In the carnivorous jungles of Nectavus VI, a fearsome Dark Angels psyker leads his battle-brothers through a gauntlet of death. Flora and fauna are stirred by the Warp to attack anything that moves, even as the skies above open in a gateway directly into the Immaterium. Nectavus VI is one of the most dangerous worlds in the Traxis sector, yet it too may become the center of a massive battle to determine the fate of the galaxy. 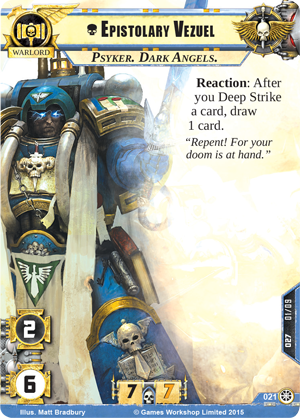 Unforgiven is the second War Pack in the Death World cycle for Warhammer 40,000: Conquest, and like the other packs of this cycle, you’ll find plenty of support for the new Deep Strike keyword. By Deep Striking your units, attachments, or events, you’ll be able to arrive at the battlefield without alerting the enemy to your presence. You’ll also find new support for each faction’s Elite units, ensuring that these massive units have a comparable impact on the battlefield. 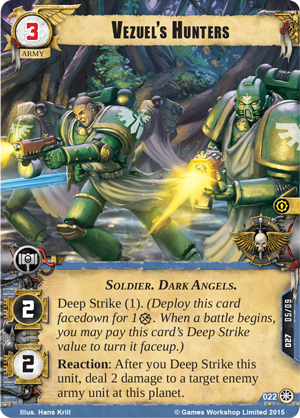 Finally, this War Pack introduces a new Space Marines warlord and his signature squad that can take full advantage of the new Deep Strike keyword! In the inimical environs of Nectavus VI, every lifeform is deadly. Few are more dangerous, however, than a Librarian of the Dark Angels legion. The Dark Angels have come to Nectavus VI to combat the power of Chaos erupting here, and with the Unforgiven War Pack, you can lead your armies as Epistolary Vezuel (Unforgiven, 21). This new warlord’s text is simple, yet potent: “Reaction: After you Deep Strike a card, draw 1 card.” First, it’s important to note exactly when this ability will trigger. 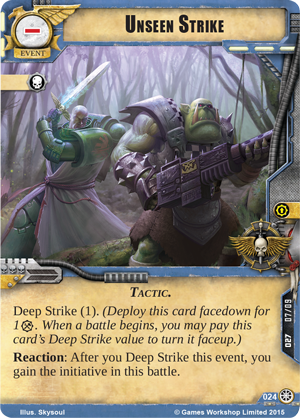 Playing a card with the Deep Strike keyword facedown at a planet during the deployment phase is known as playing that card into reserve. 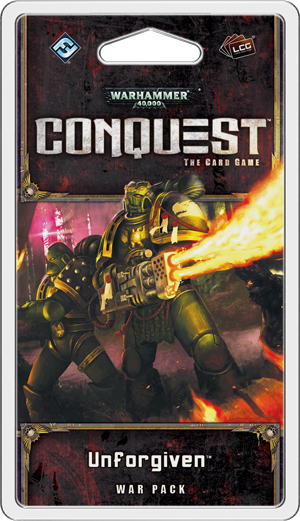 The act of Deep Striking a card occurs at the beginning of a battle, when you pay the rest of that card’s Deep Strike cost to turn it faceup and have it join the battle. Therefore, Epistolary Vezuel offers you a way to replenish your hand by drawing more cards during the combat phase. This can obviously be useful for potentially charging your hand with shield cards or combat tricks, but even if you can’t immediately use the card you draw, the extra cards can certainly come in hand during your next deployment. Finally, Epistolary Vezuel’s ability isn’t limited to a certain number of times or restricted to planets with your warlord, making this one of the most versatile abilities in the game. Given Epistolary Vezuel’s proclivity for Deep Strike cards, it only follows that his signature squad will heavily feature this keyword. Here, you’ll find four copies of Vezuel's Hunters (Unforgiven, 22), a Dark Angels unit with the Deep Strike keyword. With two ATK and two HP, Vezuel’s Hunters are fairly standard, but their Reaction is what truly sets them apart. After you Deep Strike Vezuel’s Hunters, you can deal two damage to any target enemy army unit at the same planet, potentially destroying a worrisome unit before battle begins or forcing your enemy to use a shield he would have rather saved. Naturally, the limiting factor of this ability is that it can only be used once per unit—after the unit has come out of reserve, there are almost no ways to put it back in reserve. 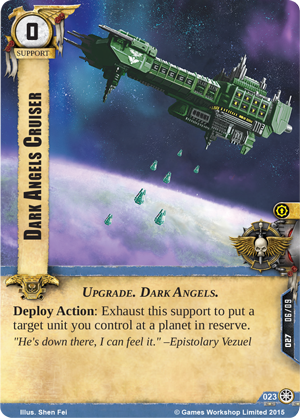 Epistolary Vezuel does have access to one of those rare options, however, with the Dark Angels Cruiser (Unforgiven, 23). You can exhaust this free support as a Deploy Action to put any one of your units into reserve at its planet. Not only does this allow you to delay your turn by spending an Action in the deployment phase, it gives you the chance to reuse powerful effects like Vezuel’s Hunters. At other times, you may need a way to win an uphill battle at a planet where your opponent has initiative. If you need to turn the tide in one of these battles, you can play one of the two copies of Unseen Strike (Unforgiven, 24) included in the signature squad. This event can only be played by Deep Striking it, but its powerful effect is completely worth the added cost: after you Deep Strike this event, you immediately gain the initiative for this battle! Having initiative can turn defeat into sudden victory or force your opponent to retreat before his plans fall into utter ruin. Whenever you gain an unexpected advantage with Unseen Strike, you can be sure your opponent will rue the day he crossed the Dark Angels. Finally, the signature squad concludes with a unique attachment, Fulgaris (Unforgiven, 25). This attachment may only be given to your warlord, and it further supports his penchant for Deep Strike cards. Whenever you Deep Strike a card, you can trigger Fulgaris to give your warlord an increased ATK and HP until the end of the phase. 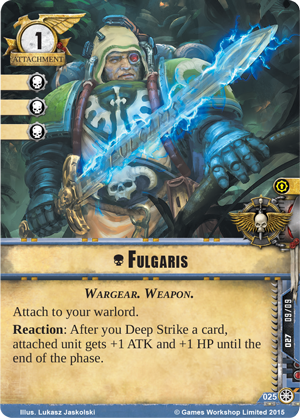 Since you may end up Deep Striking more than one card over the course of the combat phase, Fulgaris could easily turn Epistolary Vezuel into a one-man force of destruction. The enemies of the Imperium have brought the war to Nectavus VI—but you know that the Imperium will finish it here. Take up arms with the Dark Angels, and look for the Unforgiven War Pack at your local retailer in the third quarter of 2016.